After a nine month hiatus, the blog is back! 1. The fiancé and I booked a wedding venue. 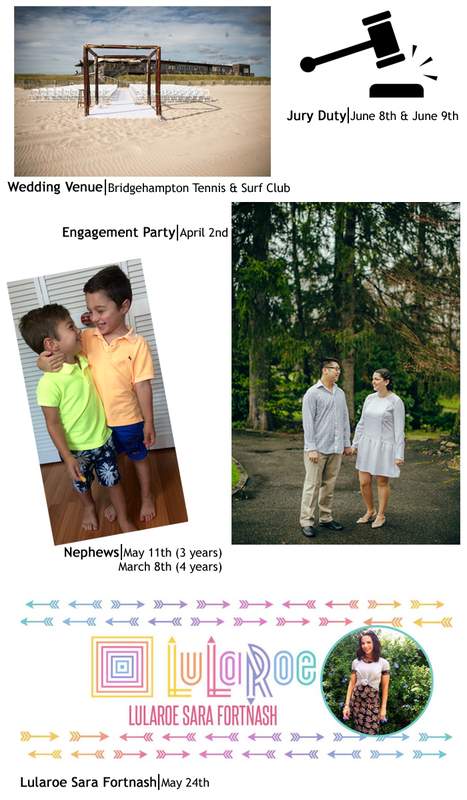 We are getting married in the spring of 2017 at the Bridgehampton Tennis and Surf Club. 2. 7 months after we got engaged, we had an engagement party! I'm pretty sure we set a record for longest time period between getting engaged and having an engagement party. 3. I went a full 9 years without serving jury duty only to return one day from work to see that I had been summoned. My friends and family did not fully prepare me for the boredom I was to experience. The first day I was ill equipped to do nothing. I was pretty sure my mental stability was being tested. Come day two I was fully stocked with three types of electronic devices and chargers for all items. I am now a jury-duty-free woman for at least six years. 4. My nephews turned three and four! I cannot believe how much they've grown. The four year old and I even had a full conversation via FaceTime. My attempts to stunt their growth have clearly failed. 5. My cousin, Sara, became a fashion consultant for an awesome company, LuLaRoe. Sara told me that I would love the clothes but I was somewhat skeptical. However, it's safe to say I'm officially addicted. To check out what she's selling you can join her Facebook group- LuLaRoe Sara Fortnash. I can't wait to share her journey with the brand, and the fabulous clothes, on the blog. I've missed this creative outlet and I'm happy to be back in the saddle. I look forward to sharing my life again with the internet.